When I compare with entrepreneurs interested in investing in online advertising, I often notice that there is still a lot of confusion about how Google Adwords works and what the marketing opportunities are available to companies. Does Google Adwords really work? The answer is certainly yes, if you are able to use it! Let’s see together what are the basics that you absolutely must know in order to succeed on Google Adwords. Google Adwords is the advertising platform of Google that allows its advertisers to carry out targeted advertising campaigns on specific target users. The network of sites where you can publish your banner (Google Display Network) reaches 80% of the world’s internet users. The first 3 sponsored ads get an average of 41% of clicks on the entire page. The market share of Google Adwords in the digital advertising sector is 33%. There are at least 300,000 smartphone apps on which you can publish your ad. 70% of mobile users call a company or a store directly from ads on Google. In the next paragraphs you will see what are the marketing opportunities of Google Adwords. However, before starting, it is better to review some basic terms to understand the platform and its dynamics. CTR – indicates how many users who saw your ad clicked it (Impression / Click). It is one of the most important metrics of Adwords. CPC – Cost per click, indicates how much a user clicks on your ad. 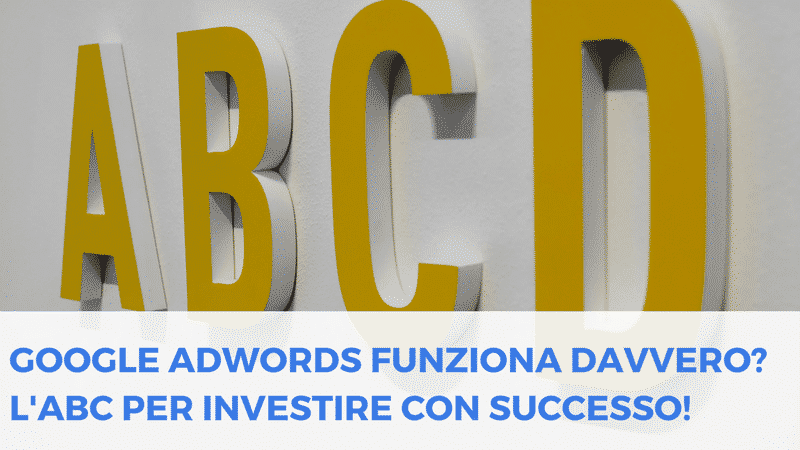 Conversion – is the measurement of the results you have achieved with your Adwords campaigns: how many sales? How many contacts? How many newsletter subscriptions? SERP – is the acronym of Search Engine Result Page, nothing more than the page with the results that appear to users after typing a query on Google. Quality Score – is the score that Google assigns to your ads based on a number of parameters such as: the relevance of your ad in comparison to the keywords used by the user, the match between your ad and the landing page, the historical performance of the ad. A high quality score allows you to spend less and get better positions. ROI – is the economic return on your advertising investment. It’s your main performance indicator because it tells you if your campaigns are profitable or not. These are some of the basic terms to know to understand Adwords, soon I will publish a new article in which you will find the complete glossary! When it comes to Google Adwords, the first thought is almost always text ads in SERP. The Adwords offer is instead very varied and allows advertisers to reach users in multiple platforms and different contexts. You can then tell your target users a specific message for each touch point in your sales funnel!